Qualcomm has walked away from a US$44 billion deal to buy NXP Semiconductors after failing to secure Chinese regulatory approval, becoming a high profile victim of a bitter Sino-U.S. trade spat. The world's biggest smartphone-chip maker and Netherlands-based NXP confirmed in separate statements that the deal, which would have been the biggest semiconductor takeover globally, had been terminated. The collapse of the deal is likely to aggravate tensions between Washington and Beijing, damage China's image as an antitrust regulator and discourage deals that need Chinese approval to go through, sources have said. "I'm very disappointed that they didn't get regulatory approval," U.S. Treasury Secretary Steve Mnuchin told CNBC in an interview. "Unfortunately, I think this is another example of where it was approved in every single other territory. We're just looking for U.S. companies to be treated fairly." Qualcomm had said that it would drop the bid for NXP, unless a last minute reprieve from China was received. There was no word from China's State Administration for Market Regulation (SAMR), the antitrust regulator reviewing the deal, after the deadline for the deal to expire passed. "We obviously got caught up in something that was above us," Qualcomm CEO Steve Mollenkopf said in an interview after the announcement on Wednesday. The deal was announced in October 2016, just days before the election of U.S. President Donald Trump and was awaiting Chinese approval even as a trade dispute between United States and China intensified and the two countries clashed on issues such as ownership of technology and patents. The Trump administration played an outsized role in Qualcomm's fate and there had been expectations that the lifting of a ban on U.S. chipmakers doing business with China's ZTE would clear the way for the NXP deal. U.S. Senator Marco Rubio, a Republican who had been critical of ZTE, in a post on Twitter blasted China's action against Qualcomm, saying: "We should reimpose ZTE ban." Qualcomm needed approval from China because the country accounted for nearly two-thirds of its revenue last year. The Chinese Commerce Ministry declined to comment on whether the deal was approved. "According to my understanding, the case was an anti-monopoly issue, and not related to China-U.S. trade friction," ministry spokesman Gao Feng said at a regular news conference. He said that while China does not want a trade war, it is not afraid of one. While the collapse of the deal will remove a big overhang from Qualcomm's stock, it will leave it on the hook to find new ways to turbocharge growth as global phone sales slow. The company said that it expects Apple to solely use modems from a rival - likely Intel - amid an acrimonious battle between the two companies over pricing and licensing costs. But it cited progress on one of two major patent royalty conflicts, thought to be with Chinese phone-maker Huawei Technologies. Of the US$700 million due to Qualcomm as part of an interim agreement, US$500 million was paid this quarter. Intel and Apple declined to comment. A spokesman for Huawei said the company would not comment on speculation. "We think moving on, reducing the amount of uncertainty in the business and increasing the focus is the right thing to do with the company," Mollenkopf said. For now, Qualcomm will buy back US$30 billion in shares if the deal fails, making good on a promise to reassure investors. The San Diego chipmaker on Wednesday also delivered surprisingly strong third-quarter results and a rosy outlook for so-called 5G technology, the next generation of wireless data networks. The company's shares rose about seven per cent in premarket trading, while those of NXP fell 6.5 per cent. 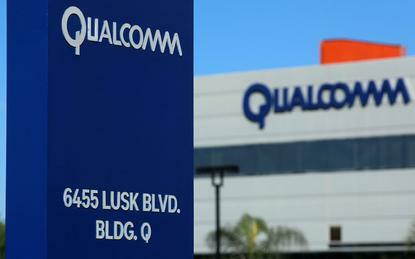 Qualcomm will pay NXP US$2 billion in termination fee by 09:00 ET on July 26, as agreed. "We believe ending the uncertainty of buying NXP is positive for Qualcomm shares," Canaccord Genuity analyst Michael Walkley said in a note to clients. He said he expects strong earnings growth over the next several years thanks to the share buyback, the likelihood that the disputes with Apple and Huawei will be settled over the next year, and that 5G will drive market share gains.